Backpacking can give scouts a great sense of accomplishment at the end of a trek. But, having something more than just mountains and miles to explore can make a trek even more memorable. One thing I've found to be of high interest to scouts is discovering wreckage, whether it's old cars, trains, logging camps, or especially airplanes. Right next to Cloud Peak in Wyoming, you can find Bomber Mountain. In 1943, a plan enroute from Pendleton, OR to Grand Island, NE clipped the top of this mountain ridge and disintegrated across a long stretch of rockfield. Now, it's a day hike from the Misty Moon area to the bomber wreckage. 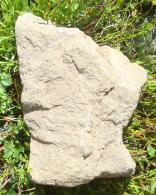 There is a memorial plaque on the shore of Florence Lake below the ridge, as seen in this photo from this summer. With a little internet research, you can find many plane wreck sites, some of which can make for an interesting hike destination or stop. Scouts might like to plan a trip to see one in your area. If you do visit a site, please remember that most likely people died there and be mindful of that. When people are concerned primarily with their own advancement, enjoyment, wealth, and success, even at the expense of others, conflicts are bound to occur. It's common to hear about swindles, robberies, and other similar crimes. We have people in business continually trying to bend or bypass the rules and laws in order to take advantage of someone else. To combat this greed, there are new regulations constantly being created. And, people trying to find new ways around them. These regulations are enforced and there are penalties if you get caught. If there was no enforcement then many people would ignore them. This is where many people get their view of policemen - people that enforce laws and imprison bad guys. But, that is a small part of the service they provide. They also perform first aid, help lost kids, provide information, make people feel safe, and many other good deeds. 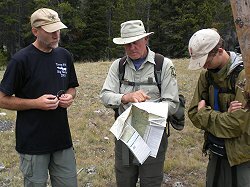 In the wilderness, you might meet a wilderness ranger, employed by the US Forest Service or other land management agency. These rangers are similar to police. They have the duty to enforce regulations, such as group sizes, campfire use, and campsite locations. Many people think of them only in this role - the role of enforcer - and therefore are apprehensive when meeting one. Unfortunately, some of the rangers also see themselves mainly in this role and they promote that confrontational view of the community. I've met a couple of these rangers over the years. They let you know that it's "their" wilderness and your group is visiting, and by gosh you'd better watch yourselves. These rangers must have the worst job in the world - being out in beautiful country but not able to enjoy it because they are too busy looking for "trespassers" causing problems. On the other hand, there are some rangers like the one I talked to on both my treks this past month. His name is Ranger Bob and he embodied what I think a ranger should be. He checked our permit to make sure we were 'legal'. He asked us our plans and how our hike was going. He pointed out a couple good sites to camp that were well away from other groups - in a way that I understood he wanted us to use them, but not in a forceful authoritarian way. Then, he let me know that fires were prohibited in the wilderness and he appreciated me bringing young guys out to enjoy the countryside. A few minutes after he left us to continue his hunt for illegal fire sites, he came back and asked if we were interested in viewing some wildlife. He then led us around a small stand of trees to see two moose in the creekbed - moose that two other groups had gone past, completely oblivious. We would have missed them to if he hadn't made the extra effort to point them out. Now, that's the kind of guy I'd like to be. Someone willing to give advice, share experience, educate visitors in proper techniques, make sure they understand the rules, and provide enforcement only when necessary. Helping folks understand what they should do, why they should do it, and how they should do it best. And, you don't have to be Bob the Ranger to do just that - we should be doing it all the time in Scouting. 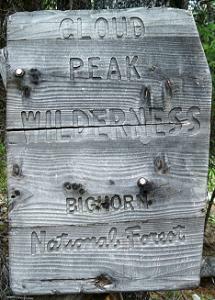 This is the Cloud Peak Wilderness boundary marker, but it could be any wilderness area. We have special regulations and laws when you set foot past that sign. It's necessary because many people still do not appreciate the value of preserving wild spaces. I'm a pretty strong advocate for the concept of Leave No Trace even though the it's an impossible goal - we always leave some trace as we go through life. I guess I prefer the term Minimize Impact better since I can be successful at that. 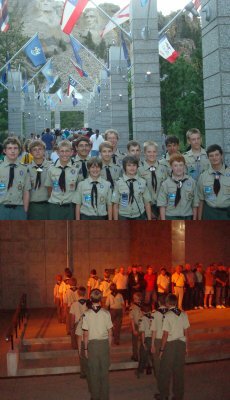 Whatever you call it, I think it's important that the Boy Scouts put more effort into integrating and embracing LNT principles. It now appears on many pages of the latest Scout Handbook and is required knowledge and practice for advancing to First Class. But, I wonder how much it is actually promoted and checked for when those requirements are signed off. Some people feel that Leave No Trace is just for wilderness areas and it's ok to hack, slash, burn, and trample BSA camps. BSA camps that I've visited are great places, but they get a lot of traffic. And, a couple uneducated scouts with a saw, ax, or shovel can do a lot of damage - damage that visitors will see for years. These BSA camps are perfect training grounds for teaching and practicing how to minimize impact so that treks to Philmont, Northern Tier, or other wilderness areas are demonstrations of skill rather than learning of skill. They aren't wilderness areas, but they'll do just fine for learning. It's not appropriate to take youth to the wilds and then start explaining what Leave No Trace is and how to do it. That should have been done since they first joined the troop so they're ready to make the right environmental decisions on treks. 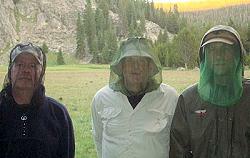 Making Leave No Trace happen depends highly on the adult leaders and traditions of a troop. If a troop has always had campfires, bathed in streams, tossed out or buried food waste, set up tents on the softest grass, ... then there is a big culture shift needed before they participate in a high adventure trek. On the other hand, scouts that are used to using backpacking stoves, compressing and carrying out garbage, looking for durable spots for tents and kitchen, digging catholes, and the like will more likely have little problem completing a trek with small sign of their passing. Our troop is fortunate to have a Leave No Trace workshop offered at least twice a year. From this, we've got a majority of scouts and adults trained in the principles. Having the knowledge makes the practices easier to incorporate into weekend campouts. Scouts look for good tent locations, stay on trails, are careful with food and pick up what they drop, strain wash water, just as a matter of course. Of course, they aren't perfect about it but we practice it and by the time they are old enough to go on any wilderness outing, they have the skills. Please consider how your troop impacts the wilds. Check with your Council Outdoor Ethics Advocate to arrange a Leave No Trace workshop or see if you can get a scout and an adult to attend a Leave No Trace Trainer class. If you have an LNT Trainer, then he can present workshops to your troop, Webelos dens, Girl Scout troops, and any other groups heading outdoors. A Leave No Trace workshop isn't sitting and learning - it should be very interactive, hands-on activities that support the seven principles and I think they are a lot of fun, whether participating or presenting. 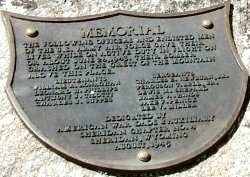 On July 31, the two backpacking crews met at Mt. Rushmore. One crew had just completed it's trek while the second was just beginning. It was interesting to see the 'enthusiasm' of one group and the 'experience' of the other when they got together. After making dinner at the campsite, we arrived at the monument with just enough time to prepare for the evening ceremony. That was disappointing since most of us would have liked to explore a little. The Ranger discussed the program with the two crew leaders and they walked the gang through the process a couple times. Then, we waited for the ampitheater to fill - and it sure did fill! You can see there was a stage full of Veterans and over 2,000 others in attendance. We met a troop from Los Angeles and a Cub Scout that can hardly wait to join a troop. To start the program, our SPL led the audience in the Pledge of Allegiance. We then listened to the ranger speak and watched a video. At the end, it was our time to lower the flag. It went well and each scout did their bit. The SPL gave commands, one scout lowered the flag, each scout held it tight, and a couple folded it. We hung around about 15 minutes after the ceremony to let all the traffic clear out and then headed to camp to rest up before our long drives the next day - home or to the wilderness. We stayed at Kemp's Kamp in Keystone, SD which is a very convenient spot for accessing Mt. Rushmore. If you're interested in lowering the Mt. Rushmore flag, visit Mt. Rushmore homepage and complete an application in January - it fills fast. Three new awards for recognizing scouts that really get outdoors are available this summer. Or, I guess you could say it's seven awards. 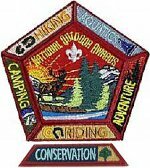 The National Outdoor Badges recognize a scout's expertise and participation in five categories: Camping, Hiking, Aquatics, Riding, and Adventure. A scout earns the core patch and a segment, then can add the other four segments over time or concentrate on a single category and add gold and silver devices for additional participation. When a scout accomplishes enough of the Outdoor Badges and wants to push himself a little more, he can earn the National Outdoor Achievement award. Recognition for this award is a medal. I like the requirements of Wilderness First Aid and Leave No Trace training, since that knowledge is vital for the other planning and leading requirements. Finally, the unit can earn a streamer for its flag by completing the National Outdoor Challenge. The requirements are pretty substantial, requiring summer camp, merit badges, Leave No Trace program, and interaction with Webelos. I don't know is where this blob of patches, segments, and pins is supposed to go. I suppose it's centered on the right pocket, but I'm pretty sure a plastic patch holder isn't going to cut it. Lots of troops already have segmented patch systems from summer camp on their right pockets - we do anyway. Preparation, perseverence, and perspiration pay off! At 13,167 feet, the top of Cloud Peak offers a breathtaking view in all directions of the Big Horn mountains and lands far off in the distance. The climb up took almost six hours. For the first four and a half hours, the top had clouds rolling across so we did not know if we could make the summit. Finally, the sun won the battle and burned off the moisture, resulting in the most fabulous views I've yet seen from Cloud. We started our ascent at 5:30am from 10,300 and gained almost 2,900 feet over rocks and boulders. The scramble up wears out your muscles, fighting against gravity and burning your energy reserves. Even though it is tiring, it is not as dangerous as the descent. After enjoying the view for a half hour, the long climb down began. At first, it's easy with gravity helping you drop down the mountain. But, the pounding weight of your body dropping on each step can soon wear on your joints. The muscles fatigued from climbing up are less stable and steps are longer on the downhill. Clambering down a rock slope requires care, concentration, and caution. Going uphill, there is very little momentum so a mis-step is more easily recovered. But, a downhill slip can mean a quick fall of a few feet and dire consequences. Mountain climbers say reaching the summit is optional but getting home is not. That is a key thought I keep in mind all the time on treks. The mountain will be there tomorrow and next year. So, if the weather is bad, the people are worn out, or for some other reason, don't force the ascent - try it another time. And, when you do reach the top - aaaaah! enjoy the view! Weather changes rapidly in the mountains. Having your raingear fast at hand is a critical bit of planning for wilderness treks to prevent soggy clothes and cold bodies. On this day, we arrived at our campsite just before big, black clouds rolled over the high peaks above us. We set up our tents and ducked inside just as the first drops started. After about 45 minutes of hard rain, the storm passed to the east, leaving this beautiful rainbow stretching across the canyon. 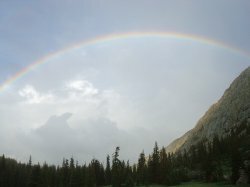 I left my tent as soon as the rain let up and was standing in our protected campsite watching the clouds roll away when the rainbow appeared. It was actually a double rainbow and the brightest I've ever personally seen. The air was fresh, clear, and cool and I enjoyed a peaceful moment with no one else around, no sound but the wind and stream, and no cares or worries. A small treasure. Two weeks and 80 miles of backpacking gets me back home where I started. I returned home with the second crew last night. 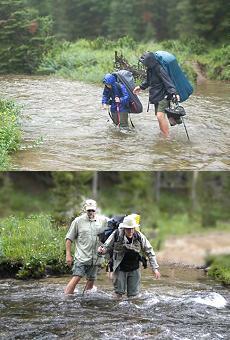 Both treks were great experiences with their own challenges and rewards. One group made it to the top of Cloud Peak, the other was thwarted by lightning and hail. We found new spots to camp, a great new restaurant in Gillette, and successfully lowered the Mt. Rushmore flag. I'll post more, so please check in daily. But, for now I've got 560 pictures to weed through and a couple thousand emails (yuch!). 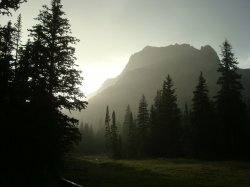 The photo here was the end of an afternoon rainstorm in Medicine Cabin Park looking west. Wait until you see what I saw looking the other direction! The great wilderness trek of 2010 begins bright and early tomorrow morning. 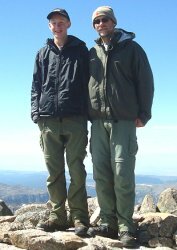 We'll be missing Jambo, but we have two crews of scouts exploring the Cloud Peak Wilderness of the Bighorn Mountains west of Buffalo, WY. The two crew leaders made their routes, menus, gear lists, and duty rosters. We have our tour permits, first aid training, and practice hikes complete. Seven scouts and four adults will cover a 36-mile route and attempt to summit Cloud Peak at a bit over 13,000 feet. You can see the Crew #1 Route. On Saturday, July 31, the first crew will leave the mountains and travel to Mt. Rushmore where they will meet up with the second crew on their way out. Both crews will perform the flag lowering ceremony at Mt. Rushmore which is a waaaaaay cool thing to experience! The next morning, I head back to Wyoming with the second crew of seven scouts and two other adults that has chosen a different 29-mile route but will also attempt to summit Cloud Peak. You can see Crew #2 Route. The routes were made on Gmaps Pedometer which is a great place to make hiking routes, bike routes, or pretty much any route you need. You can view topo, satellite, or terrain. It is very useful for planning a trip and sharing your planned route with parents. Turning on the "elevation" is pretty neat too. If you follow the route closely, you'll see an occasional squiggle of line (see mile 3 on Crew #1's route). These are spots where we plan to camp. I've not figured out how to place markers yet - anyone have advice on that? We will have our SPOT Messenger along and I plan to turn it on every morning while we hike. If you feel like checking in on us to follow our progress, see our Real-time Tracking starting Sunday, July 25.